All Florida Lottery drawings are conducted on Eastern time. 11:15 p.m. 11:15 p.m. 11:15 p.m. 11:15 p.m. 11:15 p.m. 11:15 p.m. 11:15 p.m.
Florida Lottery Draw game drawings are now available on this website. Simply click on the thumbnail below to view the drawings for that particular game. 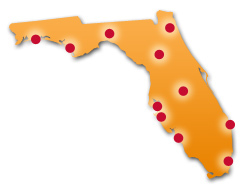 Florida Lottery Draw game drawings and/or winning numbers are shown on various television carrier stations throughout the state. Click on the city on the map below, or broadcast area in the list below, to find out more about each station's broadcast time and format.